Located on a quiet cul de sac at Spring Brook, this home has all the amenities to make your next family trip to the Dells one to remember. With convenient access to the area’s restaurants and attractions, this sprawling home is the perfect place to recharge the batteries. The outdoor area is readily equipped with table and chairs, a gas grill and in ground fire pit for evening bonfires year round. The Luxurious Ranch Getaway sleeps a maximum of 12 people. Get a good night’s sleep in one of the four private bedrooms provided. The master bedroom has a king bed; private bath with a whirlpool tub, double sinks and walk in shower. The three additional bedrooms share the second full bathroom and come with a queen bed in each. Enjoy breakfast, lunch and dinner in a nicely equipped kitchen complete with a separate dining area (additional seating at the breakfast bar) and stainless steel appliances including a dishwasher. The kitchen and dining room are open to the adjacent living room which has a gas fireplace, big screen TV and two queen sofa sleepers. In addition to DirecTV, complimentary WIFI is provided but guests are asked to provide devices. A large utility room with washer and dryer add to the conveniences afforded to guests of this home. And no need to leave the four legged family member at home; this is a pet friendly home with a limit of two dogs. 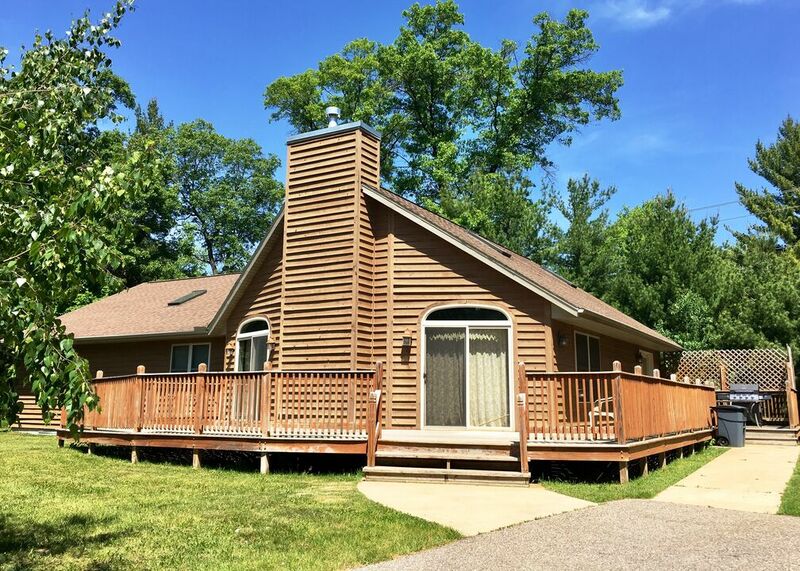 The Luxurious Ranch Getaway is located in a secluded cul de sac and is a very short drive to Spring Brook’s Clubhouse, which is home to the Spring Brook Sports Bar & Grill, indoor/outdoor pools, fitness room, golf course and pro shop. Please visit our website at www.dellshouse.com for additional info. Home sleeps maximum of 12, rates based on 8 people over the age of 3. Extra guest fee of $15/night per additional guest applies. Security Deposit of $500 required.